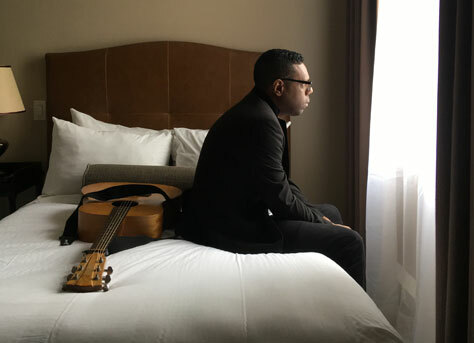 We’re delighted to be presenting a rare solo show by The Dears’ Murray A. Lightburn. Murray A. Lightburn is a composer, musician, performer and music producer. He’s best known as the lead singer and principal songwriter of internationally known Montreal chamber rock band, The Dears. Formed in 1995, their orchestral, dark pop sound and dramatic live shows cemented The Dears at the foundation of the then-emerging Canadian indie rock renaissance. In 2013, M.A.L. independently released Mass:Light, his first ever solo record. This was a concept album that CBC Music described as ‘dark and fantastic, Mass:Light shines a spotlight on Lightburn’s genre bending capabilities through assertive songwriting’. The limited edition vinyl sold out almost immediately. The Dears then released their two-volume epic Times Infinity in 2015 and 2017. The project kept M.A.L. busy touring throughout the world, while giving him space to contemplate his latest project, Hear Me Out, and perform several shows on his own. Hear Me Out is M.A.L.’s second full length solo work. While musically distinct, Hear Me Out will build on his association with The Dears to connect with a new fanbase. Local support comes from Kind Stranger. Kind Stranger are spoken word artist Ellaney Hayden with songwriters Brynn Chappell and Gareth Price. The newly formed Manchester trio summon up a dreamy blend of Americana and country soul, which pays the tariff of debt to those magicians who have come before while their songs relevant to the here and now. Kind Stranger are currently preparing to record their debut single.